New Delhi, 5th January 2012: Premier Ltd. (formerly known as Premier Automobiles Ltd.), the company that brought India its first Compact SUV called ‘RiO’, will showcase 3 stunning variants of its fresh new ‐ look model in petrol and diesel during the 11th Auto Expo, 2012 at its stall no. 10.3 located in Hall 10. The RiO’s fresh look includes new curvy headlamps, an integrated grille and spoiler giving it a much more sophisticated look. These changes have necessitated a new hood and side panels, which, along with the new bumper have improved the overall aerodynamic efficiency. To add to this, new beige upholstery has given the cabin a livelier and more spacious feel. The RiO will be powered by these engines: • 1173cc (1.2 litre) petrol engine based on AVL technology delivering 77BHP and 15 kms/litre of fuel efficiency. • 1489cc turbo diesel engine based on Peugeot technology (TUD5) delivering 65BHP of power, offering 16 kms/litre of fuel efficiency • 1.3 litre CRDI Multijet diesel engine (currently undergoing integration, testing and homologation) Both the petrol and diesel (TUD5) engines in the facelifted version will be available immediately after the Auto Expo while the Multijet Diesel engine is expected to be available by April 2012. 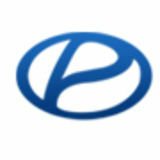 Premier is revving up its sales and service support, in addition to the three‐ year warranty being offered for the RiO. According to a company spokesperson, “Our spare parts’ pricing will not be a profit centre, but rather provide customer service and delight.” The RiO is available in four versions, accommodates 5 people, with the base model price starting from Rs 4.7 lakhs and the top‐end model at Rs 6.35 lakhs, (ex‐showroom prices, Pune), making it nearly Rs.1.5 lacs cheaper than any other SUV on the Indian roads. The RiO is currently available in four colours i.e. red, white, silver and black. All models are equipped with power steering, front power windows, electrically operated door mirrors, roof‐rails central locking and CD/MP3 players. The higher models have additional features such as anti‐lock breaking system (ABS), keyless entry and alloy wheels. RiO is also equipped with foldable split rear seats, thereby providing multiple seating configurations and its unique feature is high ground clearance enabling it to operate on all types of roads. Based on a Daihatsu model, this vehicle is sourced from the Zotye Group (China), which sells close to 1,00,000 units of this model worldwide (per annum) from its state‐of‐the‐art plant near Shanghai. 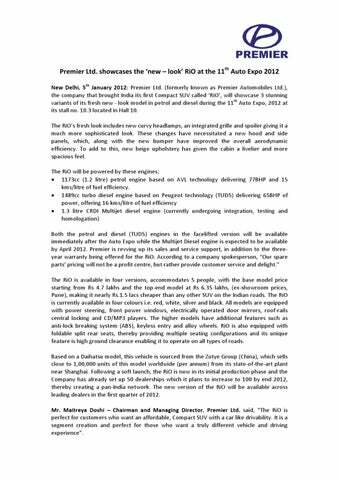 Following a soft launch, the RiO is now in its initial production phase and the Company has already set up 50 dealerships which it plans to increase to 100 by end 2012, thereby creating a pan‐India network. The new version of the RiO will be available across leading dealers in the first quarter of 2012. Mr. Maitreya Doshi – Chairman and Managing Director, Premier Ltd. said, “The RiO is perfect for customers who want an affordable, Compact SUV with a car like drivability. It is a segment creation and perfect for those who want a truly different vehicle and driving experience”. About Premier Premier Ltd. (formerly known as Premier Automobiles Ltd.), India’s oldest auto company, was set up in 1944 and commenced commercial production in 1948 through license agreements with Chrysler Corporation and subsequently with FIAT, Italy. It achieved 100% localization of its cars in 1968 and remained the market leader until the mid‐‘80s. In the ‘90s, it set up joint ventures with Peugeot (France) and FIAT, but returned to being an independent auto maker in 2004. Premier also makes a 1.5 ton LCV called Premier Roadstar and a mini‐van called Premier Sigma. In addition to automobiles, the Company is also an industry leader in the CNC machine tool industry and a major supplier of heavy engineering components to the wind energy and infrastructure sectors.